For a while Hotel Transvaal was the largest hotel in the world. The streets of the district Transvaal in The Hague, Netherlands were the corridors of the hotel, through which trams and buses were driving and the residents were the hosts and hostesses. The hotel rooms were not in one single building, but were spread over the district in premises due for demolition. As soon as these were demolished, the hotel moved on to a new location. The many existing facilities in the neighbourhood, such as restaurants, hairdressers and bakeries were also facilities of the hotel. With the idea of Hotel Transvaal the initiators aimed at putting the empty space into use again and thus giving the district a socio-cultural and economic impulse. Hotel Transvaal stands for a vision on restructuring policy at local as well as national level. Transvaal is not unique, for everywhere in the Netherlands districts are being demolished. In this way the authorities want to combat urban decay, but with the demolition the existing social structures also disappear, as well as the history of the neighbourhood and its residents. Hotel Transvaal fills the vacuum in the interim, upgrades it, looks for points of departure in order to connect the past with the future, and stresses the opportunities of a district in transition. Sabrina Lindemann (artist/urban curator) has been active with Mobile office OpTrek since 2002, a cultural laboratory for urban interactions and research, based in the Hague, the Netherlands. OpTrek works in urban areas where large scale and long term transformation processes take place with significant spatial and social consequences. In her work themes like temporary use and ‘organic’ urban area development are addressed. 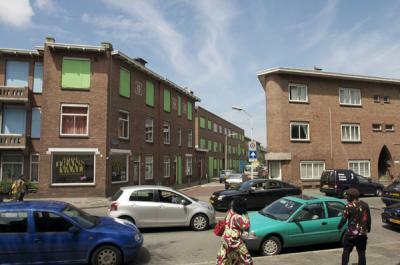 Since 2011 she works in the inner-city industrial area the Binckhorst in The Hague.